It was Pirate Day in Hastings Old Town yesterday, an attempt to beat the world record for the number of people dressed as pirates. And they did. Over six thousand people stormed the town with ooh-aahs, and shivered timbers. Pirate flags flew everywhere and drummers beat marches up and down the high street. 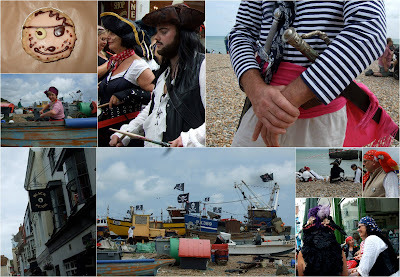 There were pirates in tea shops and pubs, with muskets and cutlasses, sashes and eye patches, stripey shirts and corsets and fabulous hats. Yes, we were among them. Babies and dogs even did their bit. The shops were all dressed up with a shipwrecked theme and bunting decorated the streets. Jack Sparrow was put in irons and cheered to liberty by the crowds. It was the most good-hearted atmosphere and tremendous fun. I'm off to the seaside again for a few days. Back soon, me hearties. Well, pieces of eight! Great post. A colleague once turned up at work dressed as a pirate, complete with cutlass and parrot. No-one was actually sure why, but all were too polite to mention it! My forthcoming birthday will be an excellent excuse to break out the underwear bunting ! I have fond memories of Hastings . There was a Jazz club in the caves . No pirates , but plenty of irresistible French students . But it still looks as entertaining as ever . Sounds like a great day. Love the idea of baby pirates. Ooh, the next best thing to being there - absolutely love the undies bunting. Do hope you're having tons of fun at the seaside, with plenty of ice cream sundaes, candy floss and lashings of ginger pop and all that.